One of the most important ideas I have begun to understand as I have worked on some of the testpieces at RMNP and closer to home is that for problems at your limit, merely hanging on to the holds is not enough. While it seems that the ability to deadhang small crimps would suffice to do a move on the same holds, for many problems this turns out to not be the case, even on apparently straightforward moves. Factors that affect the move include poor or low footholds, the angle of the wall, and less-than-incut holds. In order to complete the move the climber must consistently keep footholds and handholds loaded to as high a degree as possible. This means that you cannot simply use the minimum degree of strength needed to grip the handhold, but that you must engage the move with a complete application of power through the whole body. Pulling in with the chest, stomach and hamstring has the effect of gluing your body in close to the wall, gaining maximum height with the move. On less than positive crimps, such a position allows you to gain the most opposition and friction. I have fairly decent core strength in the sense that I typically can do a front lever without much effort. However that kind of strength is very one-dimensional and inadequate to the demands of high-end bouldering. I found for instance on European Human Being, the epitome of the crimp problem, that compression and absolute body tension are mandatory to make the best use of the very small holds. Simply hanging on was never enough. When spending a lot of time sport climbing, I learned to try to allow your body to relax on the holds as much as possible. 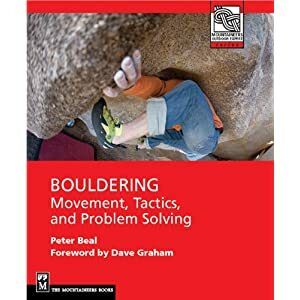 This is a formula for failure in hard bouldering as there are few stances or positions that allow any relaxation of the core and the configuration of the holds will generally not allow a simple clinging posture, even on an incut. So to get the most out of a move, especially in a steeper wall. stay in close, keep the core tension high and loosen up only when the move clearly requires or allows it. Are you just being coy??? Who thinks just because you can hang the holds you can do the problem or route??? Are you mad at your hangboard or something? This post comes off a little strange. I don't think this is being coy. Lots of climbers say to themselves that they need more finger strength but have not thought about properly leveraging what they already have. ALL climbers say to themselves that they need more finger strength. David Graham is probably mumbling about how his fingers let him down right now!! !